In England it’s apparently not customary to tell people who had you for secret Santa after you open gifts. I must say, I find this tradition very odd. I’m 98% sure that my colleague Jo knows I had her, as being the only remote member of the office, I had to mail in the package to the office and I have an idea that she opened the box. I made her a painted chalkboard mug, which I found the idea for on pinterest. 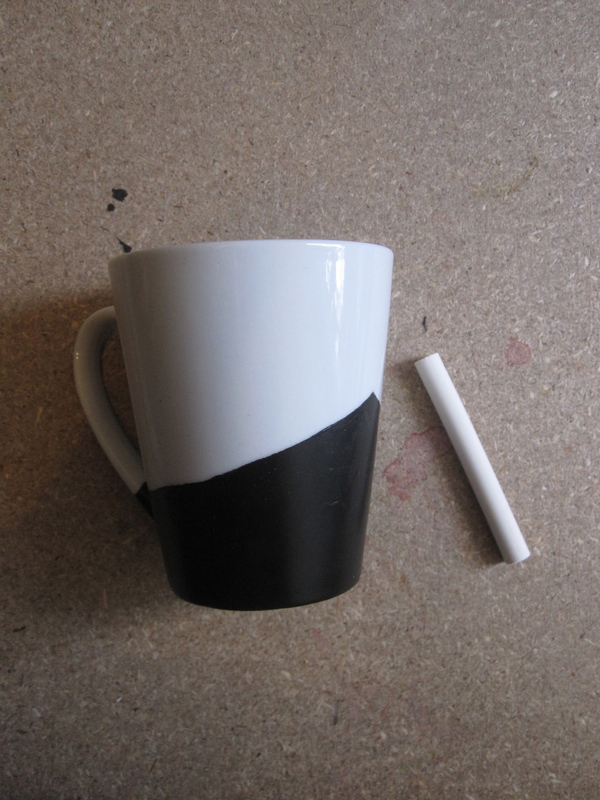 All you have to do is to get a plain ceramic mug, tape up the bits you wish to remain plain, and then paint the rest of it with an extremely specific ceramic paint. All you need to do is apply the paint where you’d like the person to be able to write on the mug (top tip- no where near where their mouth will be, don’t kill em), tape the areas you don’t want painted, let dry for 24 hours, peel tape off, and then bake the mug at 150 Celsius for 35 minutes. Careful not to brush the paint on too thickly, as you will notice where the paint runs slightly once it dries (although it is very thick paint!) Also, don’t let the mug dry with the directionality of the paint heading towards the masking tape or bits of the paint will seep under the tape, making it quite difficult to get a straight even line. Here is the accompanying letter with the mug and chalk, done in the same style as our ‘How To’ guides for putting windows together. This will also be a dead giveaway, as I’m the member of the team who does these for a living. This entry was posted in Artwork and tagged Christmas, Craft. Bookmark the permalink.